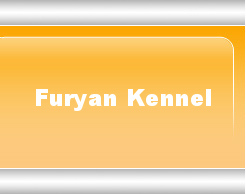 Furyan Kennels is owned and operated by Joanne Crockett of Ontario, Canada. I share a love for all furry friends but am hopelessly devoted to Rottweilers. I got my first rottweiler while working at and living in a veterinary hospital. You see I was the resident animal tehnician. Any animals requiring treatement or observation during the closed hours, I was there. I also was there in case of emergencies in the "off hours". A breeder came to the Hospital with a female Rottie having difficulty with her labour. A C-section and 12 puppies later (15 in total -3 passed away in the birthing canal), I was in love with the new mom. To make the whole process a little shorter, at the puppies' last appointment, the breeder offered a puppy of my choice to me. I was beyond thrilled. After this day, my life has never been without a rottweiler and never will be. That puppy is Kajunn pictured to the right. He has since passed away. March 21, 1993 - Dec 26, 2001. 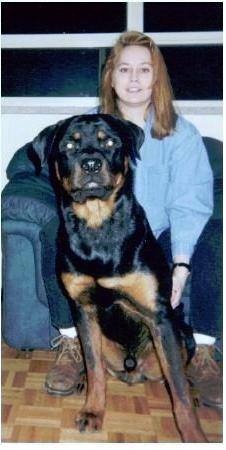 My first rottie, Kajunn at 9mths old. Winter'94 in Toronto,On. My nephew, Owen, walking Nova & Jaeger around the house.